Bach himself wrote that his Two- and Three-Part Inventions were meant, among other things, to foster ‘a cantabile style in playing’. Simone Dinnerstein – a Juilliard graduate under Peter Serkin – has evidently taken this to heart, since she adopts a legato singing approach for the majority of these pieces. Not that she cannot be sprightly when appropriate, or display brilliant fingerwork, as in the final B minor Sinfonia. And several of the Three-Part Inventions are done in an affectingly personal manner. But for the most part her playing is in a dependable middle-ground of steady tempo, carefully studied ornamentation (overstudied, for my taste, in the E flat Sinfonia) and thoroughly reliable part-playing. So if you prefer awareness of the lilt and lift of a Baroque string or woodwind player, or of a Bach cantata ritornello (which a number of these pieces echo), this disc is probably not for you. 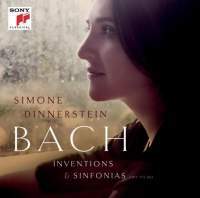 That’s not to say that the general impression is unpleasant – Dinnerstein’s tone is more refined than, say, Angela Hewitt’s, whose Bach-playing has quite a following. But even taking the playing on its own terms, I would need to hear something more joyful, or more exploratory in voicing, or more imaginative in articulation before moving from general commendation to enthusiastic recommendation.